My exam result was lower than expected. It's the exam board's fault or maybe my teacher didn't teach the right stuff. It could be her fault. I ran into the back of the car in front of me. The driver had braked too quickly. It was his fault. Betty forgot to pay her house insurance just before the chip pan fire. It was either the insurance company's fault because they didn't send out a reminder or the chip pan maker's fault because there was no warning label on the pan. Baby Bobby died from meningitis in the hospital. It was the doctor's fault because she didn't tell the nursing staff in detail what to do. Or it could have been the ambulance team. They took over four minutes to get to Bobby's house! In Market Rasen high street, Sue tripped on the kerb and grazed her knees when she fell down. It was the council's fault because the kerbstone was too high and there was no warning notice either and besides the kerb was made of concrete and not foam rubber. Donald was annoyed with what he called the fake media. It was their fault that people were learning the truth about nepotism and Russian involvement in the 2016 presidential election. And it's Crooked Hillary's fault and Robert Mueller's and President Obama's and definitely not his. Obesity is the fault of fast food companies. Drunkenness is the fault of breweries and distilleries. Welcome to the world YP. Don't blame me for only just realising Libby! I am very used to being blamed for things, for a long time I even believed it. Your first sentence is rather mysterious Kylie. Being the repeated object of blame can severely undermine one's sense of well-being. We're now on to the second generation of people who know all their rights, none of their responsibilities and think the world owes them a living. Probably people have been saying this about the generations that came after them for centuries, but it just seems so much worse these days. I agree. It does seem much worse these days. The parents of a boy I used to teach successfully sued the council because he fell off a sports centre roof! They received thousands of pounds in compensation. And the lawyers are making megabucks out of suing the other party. It makes me so cross that people are always looking to blame others and make money out it. I don't blame you for feeling that way ADDY! No blame meant YP..just a resigned shrug and sigh. I blame you for the confusion Libby! It's not my fault! 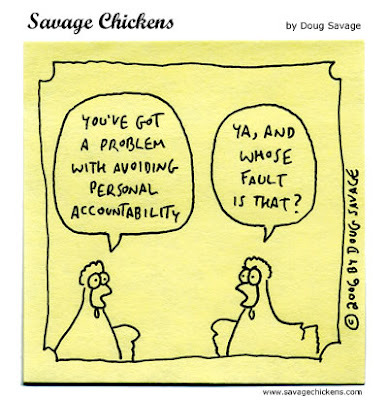 There seems to be a proliferation of narcissism which feeds the blame game! In the "me" culture "I" can apparently do no wrong. Foam rubber kerbs sound like a good idea. Although they could cause my mobility trike to tip over. When driving that thing it's best to wear a helmet and knee and elbow pads too. And if you suffer from depression, all of it is your own fault. Trust me. That is another kind of blame - mercilessly blaming oneself. Seriously, though, you're right. And on the other side of the coin, some people/institutions are getting away with things that truly are their fault, over and over - the hiding of abuses within the Catholic Church comes to mind as one that's just been in the news here for the umpteenth time. That was the children's fault. They put temptation in the way of the clerics! It's your fault I'm responding to this post!!! Thank goodness...for once I'm not to blame!!! (Speaking sarcastically) Yes - it is all my fault Lee! I once listened for as long as I could tolerate to someone going on and on about "their rights" but when I asked about "their responsibilities" I was met with blank stares. Everyone seems to have forgotten that it's a two way street. I just get so tired of all the whining - most people have never had it so good but you'd never know it. You are a hard woman Margie but I share your exasperation. There's always gotta be a bad guy! In Red Deer there's just one bad guy and he lives on Spencer Street! The blame game started when Adam ate the apple. Well, it was Eve who gave it to him, and he said so to God. Are you studying for an American law degree?